Cucumbers have a fresh, light flavor. Their crunchy-when-thick and crispy-when-thin texture is a wonderful addition to salads and crudités platters. Get the best from cucumbers with information on how to buy, store, and use these cool summer vegetables. Look for firm cucumbers, without blemishes or soft spots, which can indicate they have started to rot. They should be dark green without any yellow spots, which develop as the cucumber is getting overly ripe. At that point, it will often produce off-flavors and odors. You also want to avoid any that have wrinkles, which shows they have been stored for too long or at higher temperatures and have lost their moisture. Most grocery stores either wax cucumbers or enclose them in plastic to help them retain their moisture and keep longer. Organic cucumbers are required to use non-synthetic waxes and only chemicals approved under organic guidelines. Unwaxed varieties can be found at some co-ops, natural food stores, and farmers markets. Cucumbers are one of the "Dirty Dozen" vegetables that have been shown to have more pesticide residue. If you wish to avoid these residues, this is a vegetable you should buy organic when that option is available. Make sure to choose a cucumber variety that fits your purposes. They are generally grouped as slicing varieties, which are longer, and pickling varieties, which are shorter. Some people have trouble with developing gas when they eat cucumbers, and they may want to ensure they buy "burpless" varieties of cucumbers. Seedless cucumbers can also be found. English and Persian cucumbers are delicious without peeling. Lemon cucumbers and Kirbys are great for eating raw or pickling. Gherkins, National, and Regal varieties are best for pickling. Chinese or Asian cucumbers are the same species as melons and they can be very long and have fewer seeds. Cucumbers are a perishable rather than a hardy vegetable for storage. You will need to buy them fresh each week. You should store cucumbers in the refrigerator if you are not going to use them immediately. 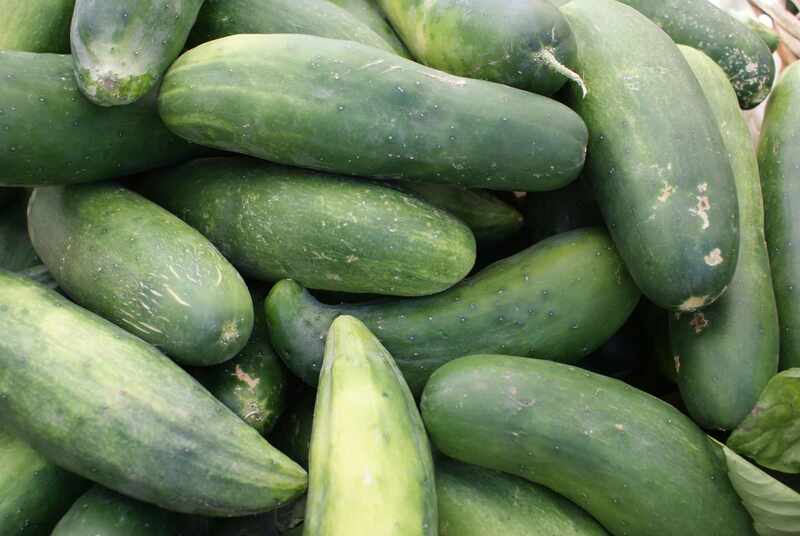 However, they will deteriorate in the refrigerator as cucumbers are prone to chilling injury after two to three days at refrigerator temperatures. They should never be frozen as they will turn brown and gelatinous. Waxed or wrapped cucumbers will keep chilled for a week or two. Unwaxed cucumbers will keep for up to a week if wrapped loosely in plastic and stored in the crisper. Once you have cut a cucumber and you have some leftover, tightly wrap it in plastic wrap and store it in a plastic bag in the refrigerator and use it as soon as possible. Cucumbers are great sliced into salads or served raw, but cucumbers also can be cooked to great effect. Peel and slice or chop cucumbers and sauté in a bit of melted butter. Sprinkle with salt and some chopped fresh herbs, if you like, for a mild, crunchy side dish perfect with simply cooked fish. For the less adventurous, scrub cucumbers clean, cut a slice and taste it. If the peel is unpleasantly thick or bitter, peel the whole vegetable before slicing to chopping for salads. Otherwise, you can leave the peel on. Serve plain with soy sauce or a light yogurt dressing. For tasty yet simple recipes see these Cucumber Salads and Cucumber Cocktails.